You probably know Slack, the team communication tool. If not, go see. It's awesome. The Slack windows app is one of the most prominent users of Squirrell for installation & update. Squirrel itself is an ingeniously simple library for installing and updating desktop windows applications. It uses NuGet packaging to build app releases and supports delta compression for updates. You don't need a NuGet feed to host your releases, just a static web server. 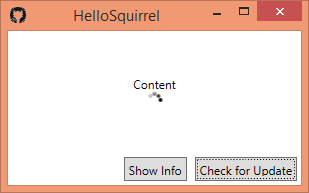 If you want to try out Squirrel, you may have a look at the starter sample mkoertgen/hello.squirrel i comitted today. It's a minimal WPF application with an update button. I wonder how Squirrel handles multi-updates. Does it apply multiple deltas or does it use the full update?